The diamond boats of Alexander Bay waiting for a clear sea day. 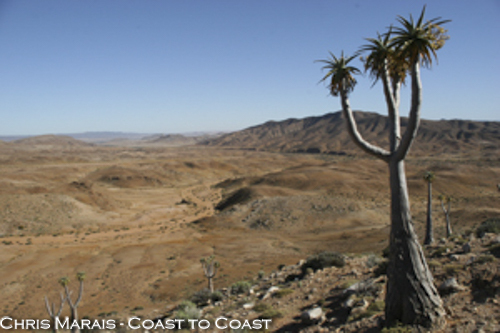 Spring, 2005 - Up here in Alexander Bay, on the Namibian frontier, you are in a world few people ever see. Wind-lashed beaches littered with twisted driftwood logs, the pounding onslaught of the Atlantic Ocean, the ghosts of ever-patrolling diamond cops, homing pigeons with dodgy agendas and, just in case you were hungry, the cheapest, freshest little oysters on earth. Alexander Bay is so very far away from the glittering windows of Tiffany’s or the New York Diamond Dealers Club on West 47th Street, the Japanese jewellery houses of the Ginza in Tokyo or No 17 Charterhouse Street in London, where more than 80 percent of the world’s diamonds pass through on their way to the ring fingers and elegant necks of lucky ladies. Flamingo gathering at the mouth of the Orange/Gariep River. And yet, the sweet little Orange River diamonds from the Alexander Bay fields have been adding a glint to lovers’ eyes since the late 1920s. The area north and south of the Mother River’s mouth is one of the world’s treasure houses of fabulous, naturally-polished high-grade diamonds. The Namas, Bushmen and Strandlopers who walked its shores centuries ago used to pick the diamonds up as they lay glinting in the sands and give them to their children as toys. Cornell’s Kop, deep in the Richtersveld. Arguably the most colourful character to have walked these ancient diamond beds was one Fred Cornell, whose prospecting nose twitched every time he ventured up into the Richtersveld. And like the copper miners who first worked here, Fred must have literally walked on diamonds without seeing them. Imagine yourself on a lonely spot up on the Orange River, having a quiet smoke in the moonlight. Suddenly, there’s the distant sound of a concertina. You go back to the campfire to discover your travelling partner being entertained by a grinning Owambo wearing a full German colonial army uniform right down to elastic-sided boots with spurs, heaving away merrily at his concertina, having just appeared out of the black night as if from nowhere. With him are two youngsters, capering away to the music at the fire. Fred gives them tobacco and is mildly amused. On they play, apparently tireless. Pretty soon it’s past everyone’s bedtime, but still the concertina continues. The Alexander Bay flotilla of diamond diving boats. The tour of the mining area (organised in advance) begins at the Alexander Bay Mine Museum. They search for diamonds out at sea and on land here, and the divers share their profits with Alexkor, Helené says as we sign the indemnity forms. She tells us what not to take in: no cigarette lighters, lipstick, lip ice, cell phones, skin cream and, of course, no pigeons. A pigeon club scam (complete with tiny harnesses to carry smuggled diamonds) was uncovered some years ago, and Man’s tame feathered friends are not welcome over Alexander Bay airspace. 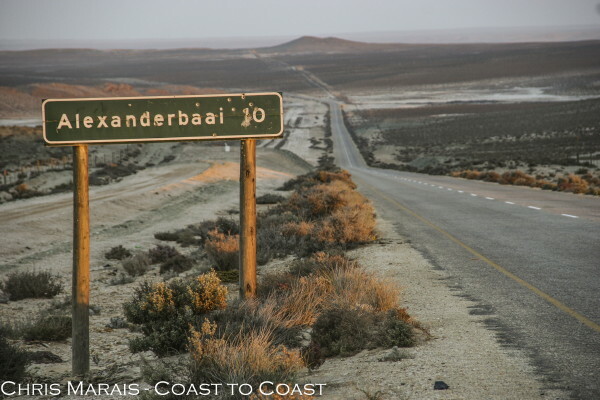 The road north from Port Nolloth to Alexander Bay. Alexander Bay society used to be divided into Binnekampers and Buitekampers (people who lived inside the restricted area and those who were outside the fence). Before leaving the area for a weekend pass, Binnekamp families and their possessions were thoroughly searched. Diamond smuggling in Namaqualand has always been as natural as truffle-sniffing in the south of France. 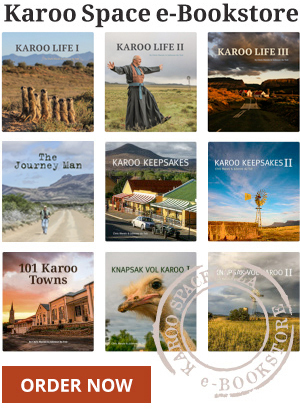 Namaqualand is a vast, barren country of not much more than 120 000 souls, a place that gets a total of 50 mm of rain each year. That’s about equal to two moderate Johannesburg thunderstorms every 12 months. “God didn’t give us rain – He gave us diamonds”, is the old Namaqualand philosophy. And, according to writer Pieter Coetzer in his excellent book called Bay Of Diamonds, many locals openly admitted to illegally dealing in the stones. But at Alexander Bay, it’s still taboo to swing your tongue too freely around the word “diamond”. If there’s the slightest bit of suspicion about you and your character, you’re packed out of the village before the morning paper arrives from Springbok. A grey and Gothic day on the mine tour. Young Ernest from Pampierstad near Kimberley is assigned to be our guard, to ensure we don’t suddenly bend down and slip a likely looking stone somewhere secret. 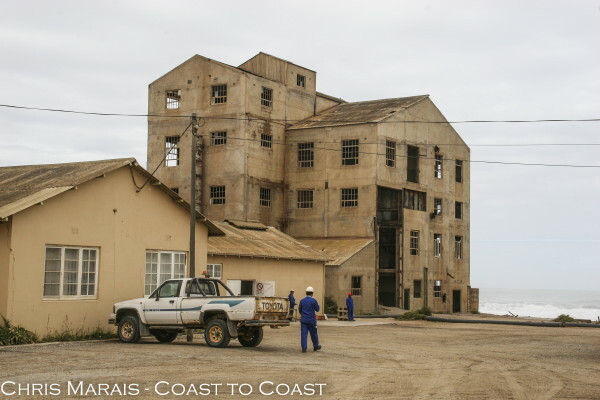 In the company of Ernest and Helené we drive through the old, Gothic-grey mining complex, a rusted dreamscape scoured by sand, wind, fog and rain over the past 80 years. There is still a lot of rehabilitation to be done out here, but, ironically, the mining operations have created some pristine areas as well. 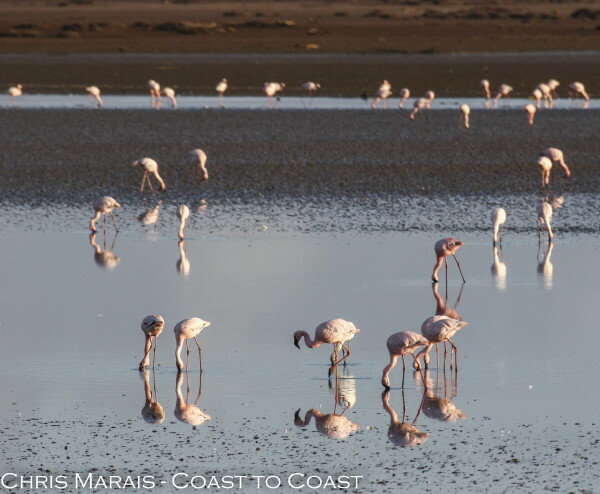 We come across beautiful stretches of stark coastline that were home to colonies of seals and cormorants, with the occasional spotting of jackals, oryx and ostriches. 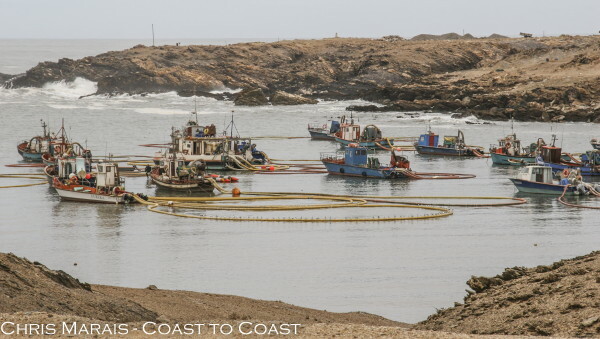 The harbour master, Alvin Williams, says although his business is mainly with the little diamond boats moored below his office, a Chinese fishing trawler in distress was once allowed into these waters. Alvin Williams, interviewed in 2005, said he loved the stillness of Alexander Bay. Alvin Williams and his family love the stillness of Alexander Bay. For lunch we stop over at the local oyster farm and feast on the sweetest little oysters, which are sold to the locals for a pittance. 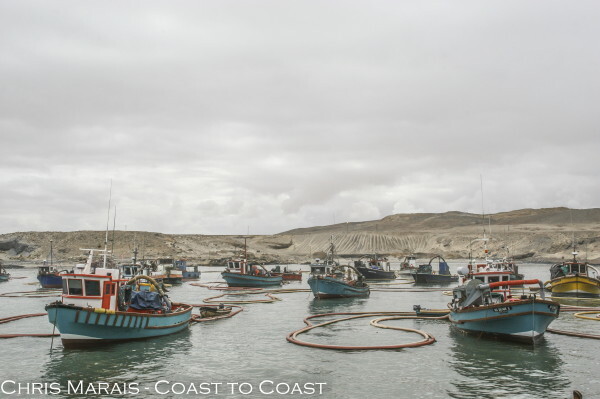 Nearly three million oysters are being cultivated out here in dams, fed constantly by the cold West Coast upwellings. We also hear about the legendary crayfish of Alexander and suddenly the lustre of diamonds take a back step. After a few hours of driving across the dunes of the diamond fields, we return to the security clearance area for a long session of interleading rooms, smoky mirrors, X-ray searches and pat-downs. Obviously, our protests of innocence and open, honest faces are not good enough for the eagle-eyed security staff of Alexcor. Oom Tommy Thomas played the fiddle for us. 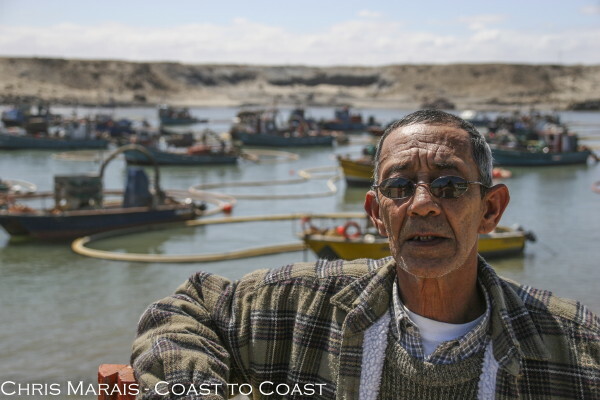 We speak to local residents of Alexander Bay. 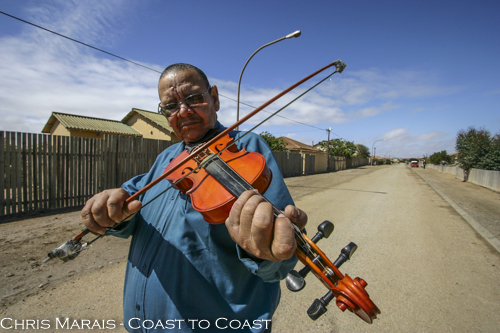 One of them, Oom Tommy Thomas, takes out his fiddle and plays a mournful version of Amazing Grace for us in the middle of the street outside his home. “Before I came here in 1990, I discussed the matter at length with the Lord,” he says. And then he tells us that the Namas of the Richtersveld would inherit Alexander Bay and her riches one day. He might well be right. The Nama community, along with the Basters from further south, have lodged a land claim with the SA government. The Namas, many of them simple goatherds who scratch a living out of the scrub desert, stand to be massively enriched by a 2003 court ruling which gives them the right to claim their traditional lands back. When this will happen and how exactly it will translate into riches for the local community still has to be thrashed out – and, no doubt, many lawyers will be well compensated in the process. 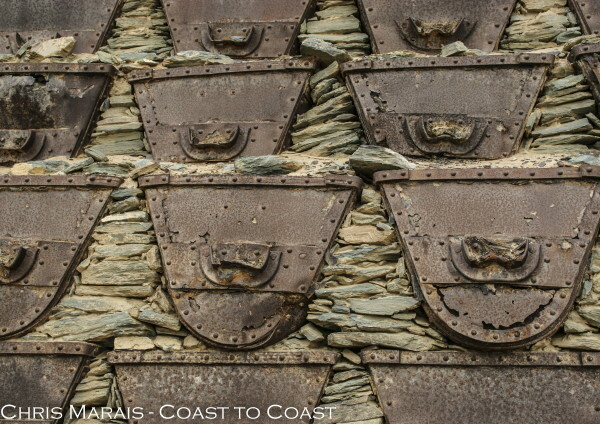 Shale and old coco pans used to build a wall. But for now, Alexander Bay is heaven on earth for a select group of hardy individuals like Etienne Goosen, who lives with his wife Nolene in the old Binnekamp. They like the rough and tumble feel of the rows of hardy houses and their rowdy inhabitants. When the Atlantic is calm enough, Etienne spends his time riding waves on the sea and diving for diamonds in its depths. Coast to Coast – Life along South African Shores by Chris Marais & Julienne du Toit is available HERE.